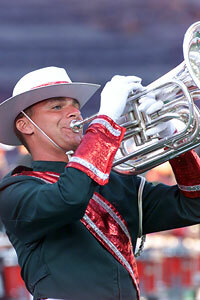 Jonathon Shaw marched as a member of Northern Aurora in 1995 and 1996, and the Madison Scouts from 1998 through 2001. 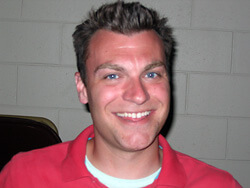 Former Scouts brass arranger and instructor Scott Boerma was his band director at Novi (Mich.) High School during his years there in the late '90s. Catching up with him at the DCI Kalamazoo event on July 5, DCI.org's Michael Boo interviewed Shaw for a first-person account of the affect of the drum corps experience on his life. Ever since I was a freshman in high school, I wanted to be a member of the Madison Scouts, and as a high school student, Scott Boerma pushed me to play the trombone. He was the one that led me to audition for the corps. I idolized him so much, that I thought it would be a good idea to march in another corps because I felt I should distance myself from him, though I soon realized that I really wanted to be with Madison. In high school, I was unfocused and unsure of what I wanted to do with my life, especially during my senior year. I had great talent, but I didn't know how to channel and focus it. My Scouts experience gave me the opportunity to use my talent. I can thank Boerma and corps director Scott Stewart 10-fold for that. Being amongst people who loved the activity and music as much as I did made it a fulfilling experience. It gave me a sense of pride and purpose that I didn't have before. The connection I had with my corps brothers, and being able to witness tens of thousands of screaming corps fans at the World Championships in Madison (1999) and Orlando (1998), was amazing. It really triggered my life purpose of entertaining. Shaw in '01 with the Scouts. The feelings of brotherhood and the performance experience I gained with the corps helped make me feel comfortable with who I was, and what I needed to do. I was put on a track for a successful life, learning responsibility and time management which helped build my character. I was taught to accept who I was and to do the same for others. All those things that shaped me gave me the confidence to go out and face the world. You never really learn how to accept failure and difficult times until you go through those situations and know how to come out of them successfully. As a corps member, I was provided a meaningful foundation that gave me a guide to follow in life. Although marching with a drum corps isn't easy, trying to find oneself is far more difficult than marching across the football field! I learned that if I wanted to get everything out of everything I could, I would need to put in as much as I could. The more I put into learning what I could accomplish and what I believed in, the more I got out of the experience. The drum corps experience comes at that critical point in life that takes you from being a child to being a young adult. It took me on a ride from being an undefined person to being a young man who could face the world. In my post-marching years, I was able to instill in the high school marching band groups which I instructed the same things that I learned in a drum corps. It made me a better teacher, and I now have the teaching techniques and communication skills to set people up for success. For those who are considering joining a drum corps, I tell them that it's a great way to utilize their talent and to continue doing what they love. I would not be who I am today without Drum Corps International and the Madison Scouts. Without drum corps, I would be someone who never capitalized on all life had to offer.